Each day, we gaze out our window at our DP writing desk, and we try to think like the mountains we see in the distance. It is a humbling ambition. We have been reading Vicious, Jon Coleman’s fiercely engaged history of human efforts to torture and exterminate wolves. We strongly recommend that DP readers purchase this book before it goes out of print, which often seems to be the fate of studies we count as absolutely indispensable for understanding the present. 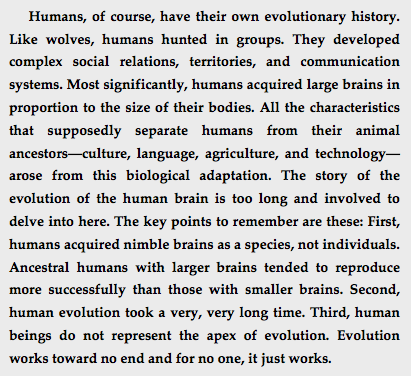 As Coleman notes, human beings do not represent the apex of evolution; in time, we will be gone, and no other species will mourn our disappearance.